Welcome to Costa Rican Spanish, the blog for Spanish language enthusiasts who want to know the subtleties of Spanish in Costa Rica. I am a Spanish speaker and teacher who grew up in the United States. After moving to Costa Rica, I realized that Spanish in Costa Rica, especially in rural areas, is quite distinct from Spanish I've encountered in other Latin American countries. 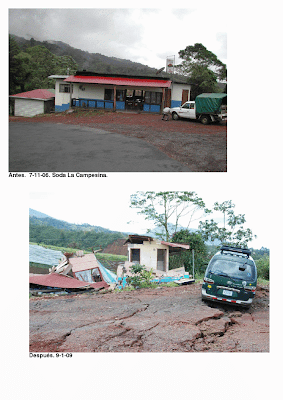 As many of you may already know, on January 8th, a devastating earthquake hit Costa Rica. 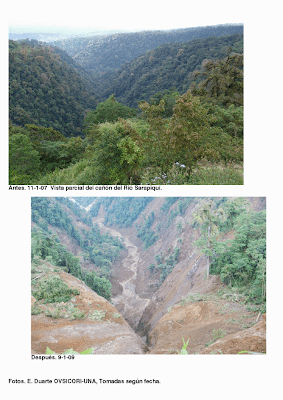 It registered 6.2 on the Richter Scale and caused massive mudslides around Volcán Poás, killing around 40 people and causing massive destruction to many people's homes. At the time of the earthquake I was in Santa Fe de Guatuso, a place that is not incredibly from the epicenter but very flat and not prone to mudslides. I could feel the incredible force of the earth beneath me, but the amplitude of the movements was great, causing a forceful swaying of the house back and forth without any damage to its structure. I assured my family back in the States that "not a single tchotchke fell from atop the TV". Anyone who's seen the living room of a typical tico home knows what I'm talking about. I am not aware of any problems with the biodigesters we built. If they were much closer to the epicenter there might have been some cracks in the cement walls. However, minor cracking shouldn't be a problem when you have very clay-like soil with poor drainage like we do. So, to put it bluntly, if seismic occurrences are affecting your biodigester you will likely have greater things to worry about. Hi, I was a an exchange student in cr when the earthquake occured. I lived in Carrizal de Alajuela, which, as I surely don't need to tell you, is very close to Poás. I was eating lunch when it happened, and my gallo pinto went all over the floor and all the TV´s in the house (big house with grampa and grandma and tíos y tías) fell over. One wall allmost came down, but miraclously the only part of the house that has a second story didn't come down, which suprised me because it's so rangly that it looks like it could be blown down by the flap of a butterflys wing. We spent the night in the yard, the family scared of eventual after-quakes, but it was an experience of a life. Anyway love this site, fond memories arise when reading about the use of apretar, ocupar (which really confused me at first) and vasilar. Have you done a "word of the day" with hulla? As in "hacer hulla" as in make noise? That earthquake was terrible, but the country continue being beautiful. What is your favorite Costa Rican Spanish word or expression? Have you ever seen two rainbows at once? Well, you betta go yoself to Costa Rica, because I've seen this twice thanks to the país muy chiquitico. This picture was taken from a car in the province of Guanacaste. This is a young Guanacaste tree in the tree nursery of the Santa Fe Women's Group. The Guanacaste, a tree that spreads out wider several times more than it does tall, is Costa Rica's national tree. Even though these trees are quite beautiful, farmers often chop them down because they take up too much space on the farm and limit the amount of open grazing area. Nonetheless, Costa Rican cattle farmers usually keep at least one of these trees on any large farm. 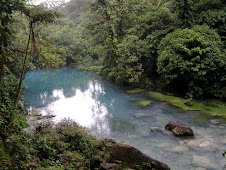 This is Rio Celeste (Light Blue River), one of Costa Rica's finest natural wonders. The minerals from the Tenorio Volcano rise up to mix with the water and turn it blue. The spot where this chemical reaction takes place is called "los teñideros", literally "the dyers" in English. On a trip to Rio Celeste you can also hike to one of Costa Rica's finest waterfalls. 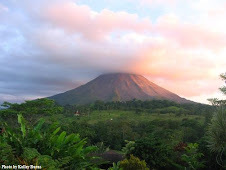 This is the Arenal Volcano, Central America's most active volcano. It's conical perfection is quite breathtaking and its numerous hot springs baths are very relaxing. These are fence posts made of tree branches. These branches continue to grow after they're planted into the ground. 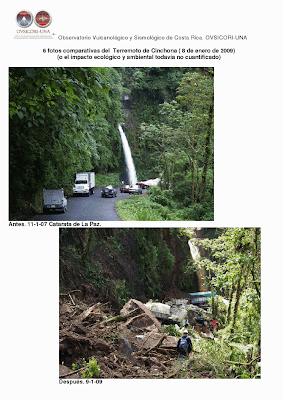 In rural Costa Rica this is a very common practice, as regular lumber and cement are hard to come by. This is a pony (portranco) running with his mother (female horse is yegua). This is doña Felipa, the old lady in Caño Ciego de los Chiles who is pushing 100 years old. (She can't say for sure how old she is.) She walks several kilometers each day between different rural towns. She even takes to the fields to 'volar machete' when she has to. She can't weigh any more than 60 lbs., but she's one tough lady. Flor de la granda, the flower of that blossoms from the granada plant, from which hangs a huge, soft fruit. It's the shape of a watermelon and the size of a canteloupe. This is a cow in rural Costa Rica. To get a cow to move in Costa Rica, you yell "aca!" It's just like 'vaca' without the 'v'. Get the CityDictionary.com Polls widget and many other great free widgets at Widgetbox!